The Heritage Townhomes are the area's premium luxury property. 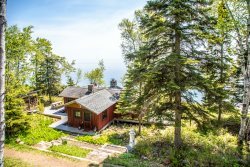 Perched hillside with panoramic views of Lake Superior, they are near the base of Lutsen Mountains and only 20 minutes from Grand Marais. In addition, The Heritage Townhomes could not get much closer to the golf course as you are situated overlooking the River 9 at Superior National at Lutsen. It is a convenient location for skiing at Lutsen Mountains or participating in the Lutsen 99er Bike Race and the Norpine Fat Bike race. This large, most luxurious 3 bedroom townhome includes a fully furnished modern kitchen which opens to the dining area and great room. Stainless appliances, flat panel TVs, gas fireplaces in the Great Room and Master Bedroom, a large deck, cantilevered for grilling and enjoying outstanding views, are just some of the luxurious features this townhome sports. This 1,750 sq ft unit has a large mudroom, two upper-level bedrooms, and one main level bedroom. The in-floor heat, as well as air conditioning, brings you the comforts of home. You can't get much more centrally located than this in Lutsen! Located just off Ski Hill Road, you are half a mile away from the ski resort and summer recreation center, including the Alpine Slide and sight-seeing Gondola. Papa Charlie's and Moguls Restaurants are near the mountain for full menu dining. There is a winery located right across Ski Hill Road (easy walking distance). Or head down toward Highway 61 and grab a bite to eat at the Lakeside Dining Room at Lutsen Resort or Lockport, both located within a mile. Good location to the ski hill (about a 1/2 mile). Beautiful views. In floor heating was a plus. Unit was clean and nicely furnished. I don't like the idea that the customer has to take the garbage 2 miles away in their own car for disposal. Maybe someone should make sure that the batteries and light bulbs work in everything before arrival also. The home was amazing, as was the view. It was very special!